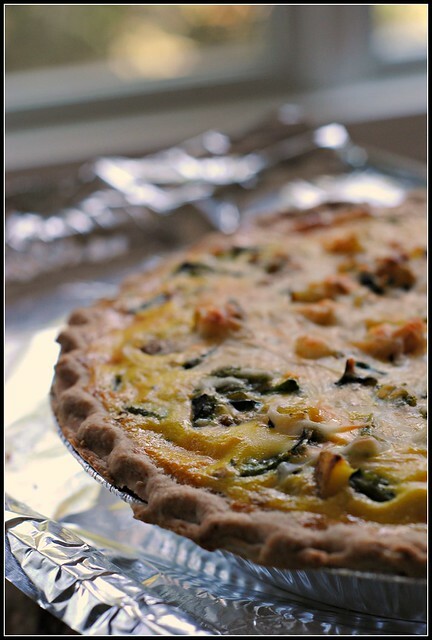 On a lazy Sunday morning 2 weeks ago, I was craving quiche. I had a leftover pie crust from my Triple Coconut Cream Pie, and it’s a shame for a pie crust to get banged up in an over-stuffed freezer. I searched my recipe archives and was struggling to pin-point exactly what I wanted. Just then, Mr. Prevention came stumbling down the stairs from his 10-hour slumber and it dawned on me to try something with some heat to pique his interest in breakfast…not an easy task. Unless it’s donuts, naturally. I quickly narrowed my search and came up with this recipe. Not surprising since I love poblanos and potatoes — why not for breakfast? This was an easy choice to make that was definitely Mr. Prevention-approved. I had a hunch that he or I would head back for a small second helping, so I returned the quiche to the oven. We chatted and ate as I sipped my way through a small pot of coffee — a favorite weekend ritual. I retraced my steps the day before and somewhat quickly remembered…I had put the quiche back in the oven (which was off, but still warm from baking). Oops. Even with my sometimes “questionable food” consumption (with only myself, not at work or with others!!! ), the quiche had to be tossed. Because of that, I want more of this quiche all the more. Preheat oven to broil (500 F) and place poblanos on a baking sheet to broil 5-7 minutes, turning once or until charred on all sides OR light a gas burner or grill and char the skins of the peppers. Place the charred peppers in a large ziplock bag to sweat for about 10 minutes. Remove the charred skins and discard. Seed and dice the peppers; set aside. Heat olive oil in a large skillet. Add potatoes and cook 7-9 minutes, or until beginning to brown. Add onion and cook an additional 5 minutes. Add poblanos and heat through, about 2-3 minutes. Meanwhile, whisk together the eggs and half and half in a medium bowl. Season with salt and pepper. Poke the bottom of the pie crust several times with a fork. Sprinkle 1/4th cup of the cheese on the bottom. Spread the potato/poblano mixture into the pie crust. 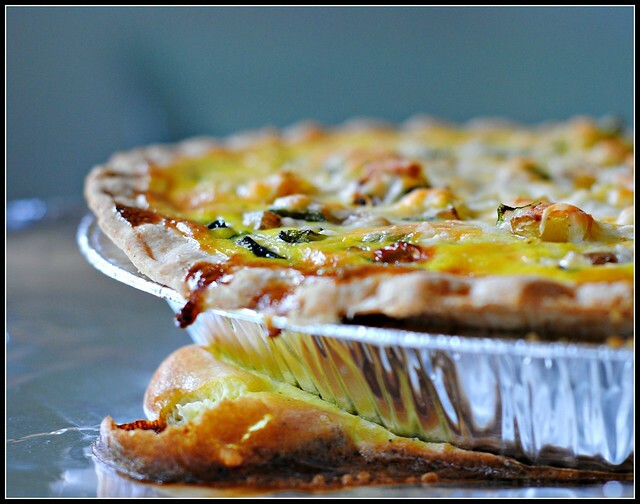 Slowly pour the egg mixture over the top, allowing it to flow into the crevices of the quiche. Sprinkle with the remaining 1/4 cup cheese. Bake 20-24 minutes or until set. Allow to sit for 5-10 minutes before slicing. Serve immediately. Result: This had wonderful flavor if you’re up for something a little spicy. This wasn’t spicy spicy, but it had a little heat. 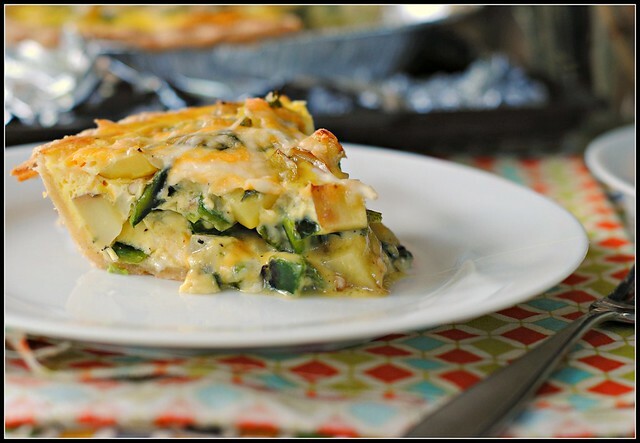 The potatoes add a fun texture and the half and half makes the eggs creamy. For the taste and portion, the calorie total is impressive! 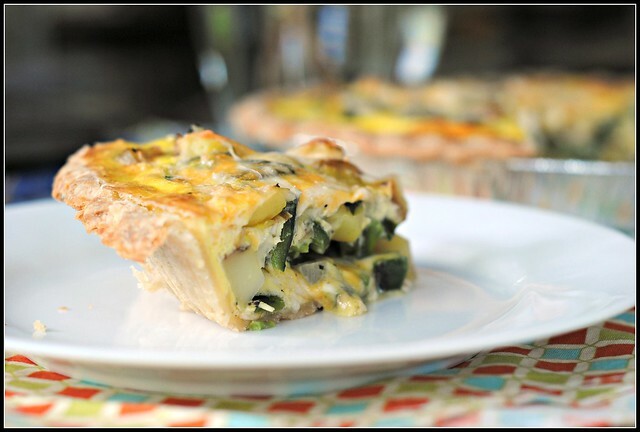 You can easily prep the veggies ahead of time to make this a quick morning quiche to throw together. Enjoy! Day 1 at the diabetes conference. As it ends up, a former co-worker from Tulsa is here, too! Thank goodness for Facebook and helping make connections. What did we do without Internet? Scary thoughts. Mmmm quiche! I love that stuff! Ahh, I love quiche! I really need to get my hands on some poblanos. I’m craving that flavor! Oh yes, I have had my share of blonde moments! I had never bought poblanos until I made your chicken tortilla soup, and they are so good! I bet this was delish! I love love love the sound of this quiche. I think I might try making it with potatoes as a crust vs. using a pie crust (not that I don’t love pie crust, but, well, you know). Poblanos are cooked like every 3 days around here, so it’s going to be a winner. 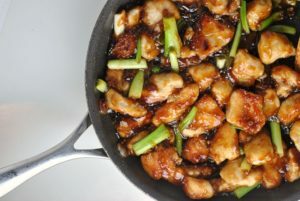 Just made this for dinner- it was a winner with the husband! I didn’t think it was spicy AT ALL! The recipe made enough filling for 2 regular (not deep dish) pie shells. Yummy! Just made the quiche and it was amazing! Very filling and the perfect amount of spice! I used skim milk because I didn’t have 1/2 and 1/2 and added chorizo since it was in the fridge. Will definitely add to the rotation! Made this today and it was really good! I used part of one large russet and that was 10 oz for me. Also my poblanos were really big so I only used three. And finally, pepperjack cheese, because I’m a Texan and like to add spice wherever I can. I’m going to add in a handful of frozen corn next time to the poblano/potato/onion mixture. Thanks for the yummy recipe! I have made lots of your recipes now and not a single one has been a disappointment! Thank you! It is such a compliment when people don’t find disappointments in recipes I post – thank you! Thank you! 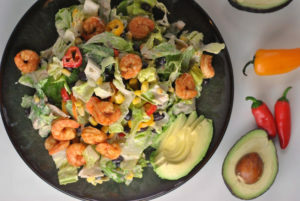 Nicole – I made this tonight and it is A-MAZ-ING!! Thank you so much for sharing it!! I am just about to put this in the oven!! I made it crustless to reduce the carbs, and used egg beaters instead of eggs – can’t wait for breakfast tomorrow!